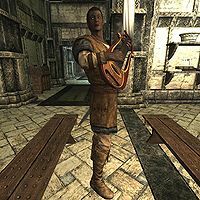 Ataf, a Redguard bard, is a student at the Bards College in Solitude. Being the youngest member of the college, he spends his days in classes to improve his talents at his chosen profession. He is eager to please both his teachers and peers, and will greet new acquaintances rather nicely. Ataf wears a set of clothes and a pair of boots. He also keeps a belted tunic on his person, but won't equip it. As befitting for a bard, Ataf has a drum, flute, and lute with him. To defend himself he wields an iron sword. He also carries a key to the Bards College and a selection of lower-class items and gold. Ataf will perform a variety of activities throughout the day at the Bards College. Very few activities in his schedule are set, but he will attend the many classes the college offers. At 4am he will go to the southwestern lecture hall on the top floor to take part in Inge Six Fingers' class. After the class breaks at 8am, he will go to the lecture hall opposite of it for Pantea Ateia's lesson. At 11am he will head out of class an hour early to go outside. Ataf will wait outside of the Bards College for three hours before heading inside again. An hour later, he will head to the library for Giraud Gemane's history class. Once the college ends classes for the day at 6pm, he will spend the remainder of his time doing whatever he pleases. During the festival he can be found playing a flute. Speaking to Ataf will have him introduce himself by saying: "Youngest bard at the Bards College, at your service." Further prodding will result in him eagerly offering you his services if you require them: "Anything I can do for you, I will." If you continue attempts at conversation, he will reply: "The pleasure's all mine." He will be less polite during Roggvir's execution; attempts at conversation will have him shoot you down: "Can we talk later?" He will occasionally be called on to perform for teachers. During Inge's class she will call on Ataf to play a piece for the class: "Be sure to watch your finger positions. Especially during the transitions. Ataf, please play back that piece for me." After completing the teacher's request, she will compliment him on his work with the line: "Very good. Let's continue with our practice." In Pantea's course the instructor will invite the students to perform whatever they please by saying: "All right, let's try something a bit more... fun." Seizing this opportunity, Ataf will sing a line of Ragnar the Red: "There once was a hero named Ragnar the Red, who came riding to Whiterun from ole Rorikstead!" Pantea will compliment him on his performance while suggesting ways to improve it: "That was better Ataf. Add a bit of emphasis on "Ragnar" and "Red."" Inge will also offer some advice in response: "Remember, it's your job to "deliver" these songs. To excite the crowd. Draw them in and they will love you for it." Ataf may have a few conversations with the local merchants. When speaking to Jala he will say: "Um, excuse me. Could I buy two leeks." Jala will reply: "Fine, Ataf. You should eat some more tomatoes, though." to which Ataf will respond: "My mother always used to say that too." Ataf may also say: "I went out ice fishing a few days ago." Jala will respond with: "Brave man, with the Blackbloods out there. Did you catch anything?" to which Ataf will say: "Naw, mostly just froze." Jala will encourage him with the comment: "Well, keep at it. The fish have to get to know you before they're willing to bite." Ataf can also purchase a drink from Evette San to prepare for the Burning of King Olaf. He will start off the purchase with the line: "I'll take a bottle of spiced wine." Evette will point out his usual sober state by saying: "I haven't known you to drink before, Ataf." Ataf will explain himself with the claim that: "Viarmo is trying to get Elisif to allow the Burning of King Olaf. I don't want to look like I don't know how to drink in front of the other bards." After the festivities, Evette will ask him if he wishes anymore spiced wine: "A bottle of spiced wine for ya, Ataf?" He will turn her down: "No thank you. I'm still feeling sick from the festival." He will occasionally discuss Illdi with Jorn. Ataf will claim that Illdi is much better than Pantea believes with the comment: "I think Illdi's better than Dean Pantea actually knows. She just gets intimidated when she's in class and can't sing." Jorn will reply by saying that Ataf is merely attracted to Illdi: "I think someone has a crush on Illdi." His fellow bards, Illdi and Aia Arria, will talk about his possible infatuation with Illdi. Illdi will start the dialogue by saying he has been looking at her: "Ataf keeps making eyes at me." Aia will respond to this by saying: "You should tell him to mind his own business." Illdi will turn down her advice: "Aia. You're so mean. I don't think he means anything by it." Aia will brush off her response by saying: "Have it your way, then." His NPC ID in the Creation Kit is "AtAfAlan", varying from his name in the game by giving him a last name. Ataf has no sleep package and continues his last action all night until another package takes over. As Inge will not visit her class during class time, Ataf and the other students will just quietly sit through the class. He will still play the piece for the class as prompted by Inge from the Library. 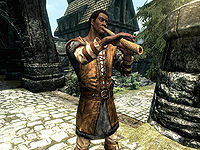 Ataf should have played his flute for the people of Solitude while outside between 11am and 1pm, but will just stand idly. This issue has been addressed by version 1.2.5 of the Unofficial Skyrim Patch; rescheduled to the evening. Ataf has no scheduled visit to the market, so the market dialog rarely happens. This issue has been addressed by version 1.2.5 of the Unofficial Skyrim Patch; scheduled noon to 3pm. Considerable dialogue was written for Addvar and his various customers. Unfortunately, they were recorded in Jala's voice. Ataf's dialog is mixed with Jala's other dialogue. See Addvar Bugs for this dialog. Ataf will sometimes sing the first line of the song "Ragnar the Red" while wandering around the college.